Stretching over 2500 km along the coast, weather in Vietnam varies from the North to the South. 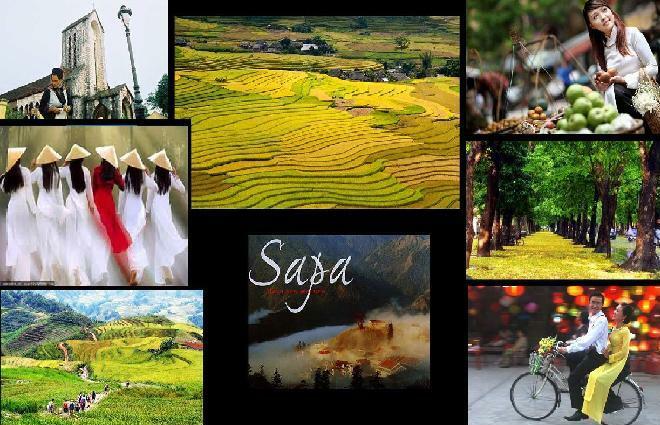 Travelling between November and February is the great time to visit all the places along the country as it is winter in Vietnam. During this time, the weather in the North is colder than the rest of the year, with the temperature similar to autumn in the Western countries while dry season with warm sunshine starts in the South. In addition, there are many special festivals and celebrations during this time such as Christmas, Lunar New Year and others interesting folk activities which add more color and excitement to the cities. However, the festival time also means that the price of transportation tickets, hotels, and others services at this time often go up dramatically. Southern Vietnam, in the opposite side, does not have winter. This part of the country enjoys a warm climate all year around, with temperature ranging from 22 to 34 Celsius Degrees. From March to June, you had better choose to visit Vietnam beaches in the Centre and South Vietnam to enjoy the clear sky, shining sunshine and gentle sea wave. Storm season in the Centre and rainy season in Mekong Delta starts in July and last until October. Be prepared for heavy rain and flood if you are planning to travel during this time. There is no visa on arrival to Vietnam. You need to apply from Vietnamese Embassy in your country or contact with authorized online agent to get “letter of approval” before taking the flight to Vietnam. With the first option, you need to go to the nearest Embassy or Consulate or send your passport by post to them. The process may take a month and if approved, visa will be stamped on your passport. The advantage of this option is that you do not have to queue at their VOA counter when arriving airports. The disadvantages for me are the inconvenience of travelling to the Vietnamese Embassy which located in capital and the fear of losing my passport when it is sent by post. The second option is to use service of a travel agent in Vietnam, fill some forms and get the approval letter in one or two days. With this letter, you need to queue and present it to VOA counter and they will stamp Vietnam visa on your passport. I find this option is safer and easier for me as every step I can do online, no worrisome of losing my passport and shorter time to get my visa. I use vietnamvisa.org.vn and get what I want. The only annoying thing is the long queue at the custom window. My advice is that depend on your situation; choose the option that better suit you. With the boom of tourist stream to Vietnam in the last 10 years, there are hundreds of travel companies in Vietnam. My advice to first-time travelers is to travel as part of a tour to avoid common tourist traps, such as being scammed, being overcharged, or even getting lost. A realizable travel agent also can help you arrange your flights, accommodations and tell you the history/ specialties of the place you visit. Do not choose randomly. Contact a number of tour providers, read reviews on travel websites about them, and rely on the speed and helpfulness of their replies to evaluate standard of their service quality. “Better safe than sorry”! If you decide to travel alone, make a detail plan before you go. Vietnam is a safe country, however, like everywhere in the world, tourists are vulnerable to pickpocket, rip off, … Just keep important things (wallet, passport, travelling tickets,… ) close to you like you do at home and accept that most of the time, you will have to pay higher price than the local. Sometimes the difference will be nominal, other times it will not. Before using any service, ask for price first and try to bargain. It is your right, your choice! Be prepared that things will go wrong. Vietnam is not a developed country like ours. Trains and planes normally never depart and arrive on time. Traffics are crazy. But come on, isn’t it what you expect when visiting an Asian country? Come there with a smile and an open mind, it will be ok at the end.